OB. OCT: 26 A.D. 1848. OB. FEB: 12 A.D. 1854. Charlotte Myers (born in Oxford in 1807 and baptised at St Thomas’s Church on 8 February). Alick Carter (born in Wytham on 18 April 1810 and baptised there on 25 April). Abel Myers (born at Dodd’s Passage in 1831 and baptised at St Mary Magdalen Church on 30 October, with his surname spelt “Miers” in the register). James Myers was a baker, and at the time of the 1841 census he and Diana (who appears to have been known as Ann) were living at Magdalen Street with their son Abel (9). By 1848 they had evidently moved to George Street, which (apart from the south-east end) was still in the parish of St Mary Magdalen. 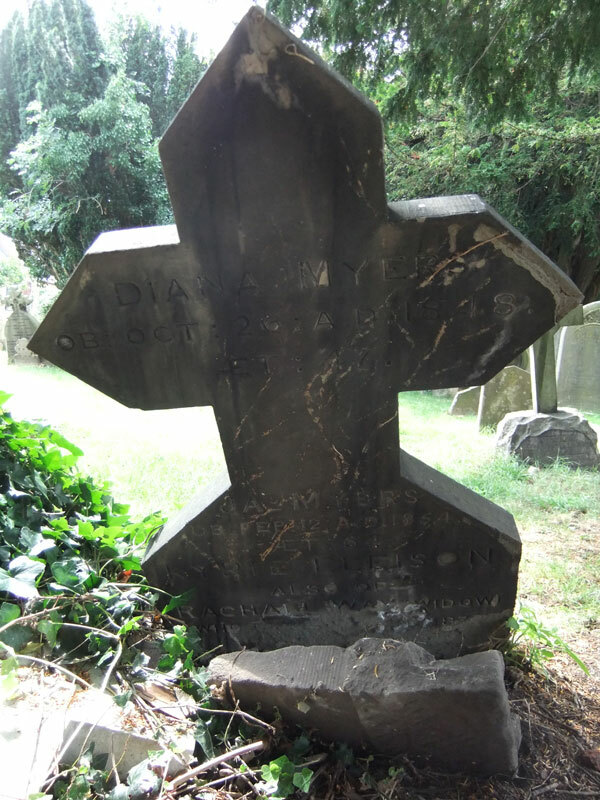 † Mrs Diana Myers née Carter died at George Street at the age of 47 on 22 October 1848 and was buried at St Sepulchre’s Cemetery on 26 October (burial recorded in the parish register of St Mary Magdalen Church). Her death announcement in Jackson’s Oxford Journal on 28 October 1848 read, “Oct. 22, after a severe illness, Diana, wife of James Myers, biscuit-baker, George-street, aged 47.” Her surname in both the parish register and the General Register Office entry, however, was spelt as Miers. At the time of the 1851 census James Myers, now described as a fancy bread baker, was living at St Giles’s Street: he gave his age as 62, but he was in fact only 58. His only son Abel (19), who was working as a printer, was living with him. † James Myers died in St Thomas’s parish (with his age recorded as 64, but he was actually 62) on 12 February 1854 and was buried at St Sepulchre’s Cemetery on 16 February (burial recorded in the parish register of St Mary Magdalen Church). Abel Myers, the only child of James and Diana Myers who was born in 1831, is hard to trace after 1851. Rachel Carter (born in 1793, but very flexible about her age) was the elder sister of Diana, and her husband was probably the Thomas Way who in 1841 was an agricultural labourer aged about 50 living in Stanton St John. He died in 1850 and was buried in Stanton St John churchyard on 14 July. At the time of the 1851 census Mrs Rachel Way, who described herself as an agricultural labourer’s widow, was living at Parsonage Farm House, Stanton St John. By the time of the 1861 census Mrs Way (61) was the housekeeper at 11 Walton Street, Oxford and spent census night alone in the house with the housemaid Ann Attwell (53). In 1871 the situations were reversed: Ann Attwell was the housekeeper, and Mrs Way (71) was one of two servants at the house. † Mrs Rachel Way née Carter died at 11 Walton Street at the age of 80 on 26 November 1873 and was buried at St Sepulchre’s Cemetery on 1 December (burial recorded in the parish register of St Mary Magdalen Church). Her death notice in Jackson’s Oxford Journal of 6 December 1873 reveals the name of her employer: “Nov. 28, at 11 Walton-street, aged 78, Mrs. Rachel Way, for many years the faithful servant of the late Jas. Banting, Esq., of this city.” James Banting, a tailor, had been Mayor of Oxford in 1832/3; he never married, and died at his residence in Beaumont Street on 4 March 1859. His sister, Miss Ann Banting, was living at 8 Walton Place at the time of the 1851 census, when Ann Attwell was her only servant. Miss Banting died at Walton Street at the age of 73 on 28 May 1859.